Bringing Home the Bacon: World Pork Expo: Westward O! World Pork Expo: Westward O! Last week Husband, Ryan, Justin and I drove 10 hours in our pick-up truck to the World Pork Expo in Des Moines, Iowa, with a trailer full of pigs. I then made a side trip to deliver souvenir underwear to a dear friend in Omaha. I decided to time-delay my posts on this event for the safety of our farm, and because I wouldn't want someone to haul off my livestock-event-themed undergarment collection. To start from the beginning of our adventures, check out the thong-a-riffic World Pork Expo - Day 1, poop-filled World Pork Expo - Day 2 and the blue-ribbon World Pork Expo - Day 3. I have kept you in suspense long enough. I know you have been DYING to know the secret identity of my hapless friend who received the WORLD. PORK. EXPO. THONG. Well, the thong was awarded to my dear friend Megan. Why? 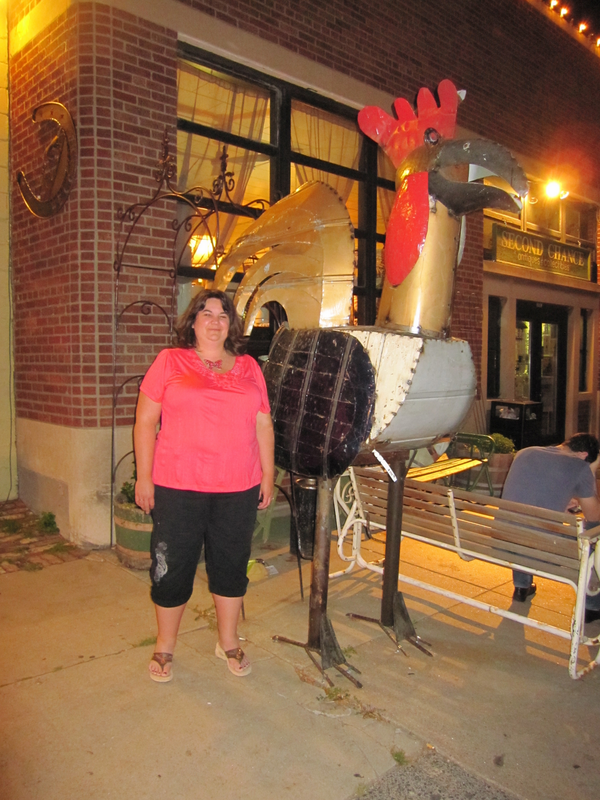 Because she is the kind of friend who when encountering a giant metal chicken on the sidewalk of Omaha will look at me and say, Knock, knock motherf*cker and then snap my photo after I get done squealing The Bloggess, The Bloggess. Also, she drove a five hour round trip to fetch me from Des Moines so we could head out west in her covered mini-van. 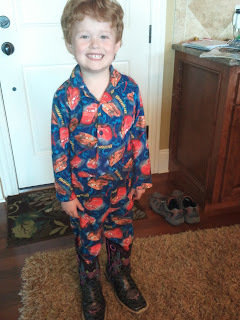 My mission of delivering the prized World Pork Expo thong accomplished, I was then free to enjoy spending time with her adorable boys who also LOVED the new boots their Mom helped me review so many months ago. Megan and I had some grown-up time eating dinner at Omaha's wonderful Old Market District and during my whirlwind visit, ending up passing a wonderful art installation on a silo multiple times. 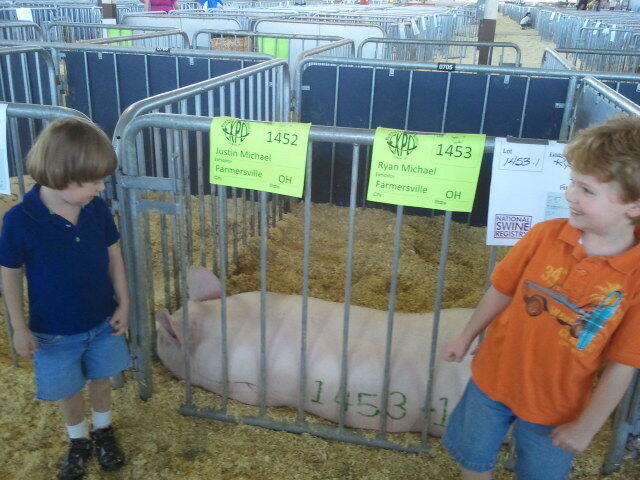 Meanwhile, back at the World Pork Expo, Husband and the boys were busy getting the gilts sold at auction. Don't worry. All three are off to live on other farms and very soon will be losing their gilt-ginity. When Megan dropped me off to catch my ride back to Ohio, her suburban Omaha boys got to learn all about pigs from my rural Farmersville boys and all of us were able to fill our shoes with sawdust. As her token farmer friend, which seems odd now that she lives in knock, knock mofo NEBRASKA, she can keep up with farm life on this blog, of course. But now WE can keep up with the happenings in Omaha via her brand new blog, OmahaHa!, named for Warren Buffett's left testicle a clever play on the city's name that just makes you want to smile in a friendly non-judgemental way, just like Jesus. 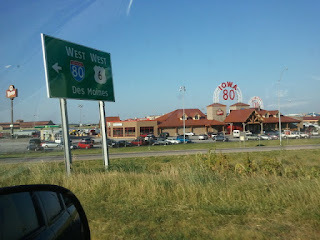 Well now that I have just proven there IS something more crass than bringing a thong as a hostess gift, I will wrap up this delightful series on the World Pork Expo with a parting shot of the Iowa I-80 truck stop, the largest in the WORLD. We ate at Pizza Hut. We were sick and tired of pork. Oh Holly, you are the midwestern Bloggess! Pigs in the yard instead of scorpions and vultures. Same diff! You crack me up! Jenny, you are too kind. I'll have to add you to my thong gift list for next year.